President Trump has complained about the recent stock market slump, calling it a "big mistake". 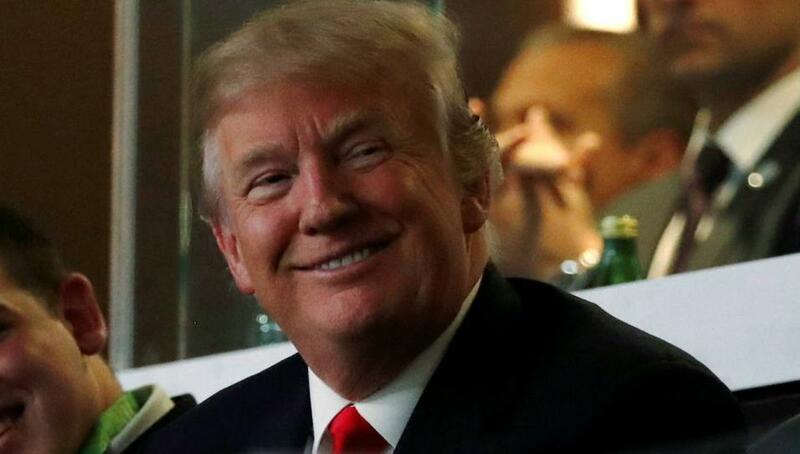 US Politics: Trump calls stock market slump a "bad mistake"
Donald Trump has criticised the investors who triggered poor stock market performance this week. "We’ve always been looking at the long-term impact of the stock market. It’s still up over 30% since the election, and we continue to think America is a great place to do business." - Steven Mnuchin, Treasury Secretary. Quick to take credit for the stock market, Donald Trump has turned his back on it this week, calling the recent slump a "big mistake". In a tweet yesterday (February 7), the US President said: "In the 'old days,' when good news was reported, the Stock Market would go up. Today, when good news is reported, the Stock Market goes down. Big mistake, and we have so much good (great) news about the economy!" The change of heart on investors comes after a record-breaking sell-off on the US exchanges, causing the Dow Jones industrial average to fall 1,175 points earlier this week after a disappointing end to January. Experts suggest this sudden drop was the result of a stronger than expected growth in wages, which triggered speculation that the Federal Reserve may be about to raise interest rates. It comes as the US reaches near full employment and higher wages should be a positive sign for Americans and the President. However, investors often take them as an indication of change ahead. Since President Trump was elected, the stock markets have been one of his favourite topics of conversation, praising himself for the record highs of the US and global markets since his inauguration. Unlike any other modern US President, he has consistently highlighted the Dow performance as evidence that his economic policies are working and "making America great again". In his tweet, which was the first statement he'd made about the stock market since the slump, President Trump didn't go into any more detail about the reasons behind the poor activity or what it may mean for the long term. Earlier in the week, White House Press Secretary Sarah Huckabee Sanders said "the President's focus is on our long-term economic fundamentals, which remain exceptionally strong, with strengthening US economic growth, historically low unemployment, and increasing wages for American workers". However, Trump's decision to not follow up his "big mistake" tweet with any insight or reassurances of the stock market has left many stuck for answers. It seems that even his own supporters are struggling to navigate an administration that takes credit for record-high stock market performance but then distances itself from investors as soon as the mood changes. Treasury Secretary Steven Mnuchin tried to walk this line, ensuring that President Trump's policies were still given credit for the boom but assigning the blame for the recent sell-offs elsewhere. Speaking at a House Financial Services Committee hearing, Mnuchin, like Sanders, shifted the focus past the immediate future. He said: "We are very focused on long-term economic growth, and we believe that the policies that we have enacted, including tax reform, are very positive for long-term economic growth." He also made sure to highlight the performance of the markets since Trump's inauguration, adding: "We've always been looking at the long-term impact of the stock market. It's still up over 30% since the election, and we continue to think America is a great place to do business." This was a clear response to questions about whether the administration would cease to tie its success so closely to stock market activity. "We couldn't be happier with companies' response with more and more investments in the US," Mnuchin added. Although Trump and the Republicans have been quick to take credit for the recent boom in US stocks, the markets have been on the climb for much longer than his time in the Oval Office. Low interest rates and global economic strength, nevertheless bolstered by Trump's corporate tax cuts and push for deregulation, have pushed many financial markets - including the US - to new highs. However, this is now leading investors and economists to predict a change from central banks, bringing much instability to the markets. The recent boom in the economy seems to have worked in Trump's favour, according to a recent poll from Quinnipiac. Although by just a slim 51%, the majority of those asked now believe President Trump is handling the economy well, which has been a long-time concern of many voters since his election. There's also been a shift away from his predecessor, with 48% of respondents citing Trump as the reason for the strong economy, compared to 41% who believe Barack Obama is responsible for the most part. Americans are still split - 28% to 27% - on whether their own tax bill will increase or decrease in light of Trump's reforms. However, nearly two-thirds (62%) believe the plan will mostly benefit the wealthy.